Automobili Lamborghini S.p.A. is an Italian brand and manufacturer of luxury sports cars. Lamborghini's production facility and headquarters are located in Sant'Agata Bolognese, Italy. Manufacturing magnate Italian Ferruccio Lamborghini founded the company in 1963 with the objective of producing a refined grand touring car to compete with offerings from established marques such as Ferrari. The company's first models were released in the mid-1960s and were noted for their refinement, power and comfort. 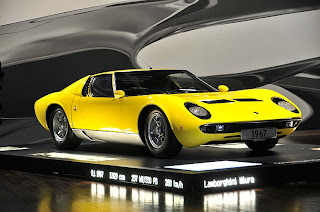 Lamborghini gained wide acclaim in 1966 for the Miura sports coupé, which established rear mid-engine, rear wheel drive as the standard layout for high-performance cars of the era. Lamborghini grew rapidly during its first decade, but sales plunged in the wake of the 1973 worldwide financial downturn and the oil crisis. Ferruccio Lamborghini sold ownership of the company to Georges-Henri Rossetti and René Leimer and retired in 1974. The company went bankrupt in 1978, and was placed in the receivership of brothers Jean-Claude and Patrick Mimran in 1980. The Mimrans purchased the company out of receivership by 1984 and invested heavily in the company's expansion. Under the Mimrans' management, Lamborghini's model line was expanded from the Countach to include the Jalpa sports car and the LM002 high performance off-road vehicle. 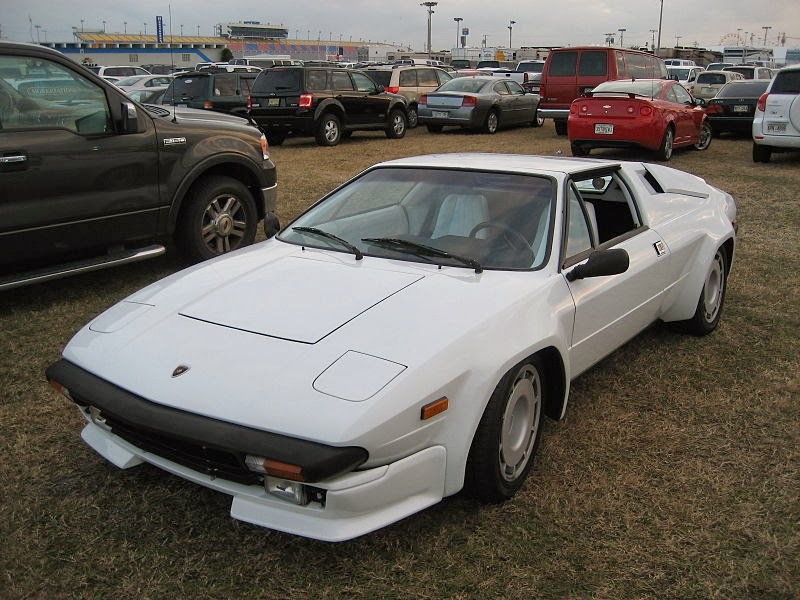 The Mimrans sold Lamborghini to the Chrysler Corporation in 1987. After replacing the Countach with the Diablo and discontinuing the Jalpa and the LM002, Chrysler sold Lamborghini to Malaysian investment group Mycom Setdco and Indonesian group V'Power Corporation in 1994. In 1998, Mycom Setdco and V'Power sold Lamborghini to the Volkswagen Group where it was placed under the control of the group's Audi division. New products and model lines were introduced to the brand's portfolio and brought to the market and saw an increased productivity for the brand Lamborghini. In the late 2000s, during the worldwide financial crisis and the subsequent economic crisis, Lamborghini's sales saw a drop of nearly 50 percent. Ferruccio Lamborghini, the man who would found Automobili Ferruccio Lamborghini S.p.A. in 1963, was the child of viticulturists living in Renazzo di Cento, Province of Ferrara, in the Northern Italy's Emilia-Romagna region. After serving as a mechanic in the Italian Royal Air Force during World War II, Lamborghini went into business building tractors based on surplus WWII military hardware. 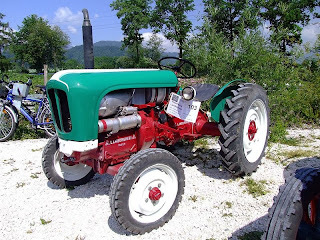 By the mid-1950s, Lamborghini's tractor company, Lamborghini Trattori S.p.A., had become one of the largest agricultural equipment manufacturers in the country. He was also the owner of a successful gas heater and air conditioning manufacturer. Lamborghini's wealth allowed him to cultivate a childhood interest in cars, owning a number of luxury automobiles including Alfa Romeos, Lancias, Maseratis, and a Mercedes-Benz. He purchased his first Ferrari, a 250GT, in 1958, and went on to own several more. Lamborghini was fond of the Ferraris, but considered them too noisy and rough to be proper road cars, likening them to repurposed track cars. When Lamborghini discovered that the clutch on his Ferrari was broken, and actually was the same clutch that he used on his tractors, Lamborghini went to Ferrari and asked for a better replacement. Ferrari responded, saying that he was just a tractor maker, and could not know anything about sports cars. Lamborghini decided to pursue an automobile manufacturing venture with the goal of bringing to life his vision of a perfect grand tourer. Prior to founding his company, Lamborghini had commissioned the engineering firm Società Autostar to design a V12 engine for use in his new cars. Lamborghini wanted the engine to have a similar displacement to Ferrari's 3-litre V12; however, he wanted the engine to be designed purely for road use, in contrast to the modified racing engines used by Ferrari in its road cars. Autostar was led by Giotto Bizzarrini, a member of the "Gang of Five" of Ferrari engineers, who had been responsible for creating the famous Ferrari 250 GTO, but left the company in 1961 after founder Enzo Ferrari announced his intention to reorganize the engineering staff. The engine Bizzarrini designed for Lamborghini had a displacement of 3.5 litres, a 9.5:1 compression ratio, and a maximum output of 360 bhp at 9800 rpm. Lamborghini was displeased with the engine's high revolutions and dry-sump lubrication system, both characteristic of the racing engines he specifically did not wish to use; when Bizzarrini refused to change the engine's design to make it more "well-mannered", Lamborghini refused to pay the agreed-upon fee of 4.5 million Italian lire (plus a bonus for every unit of brake horsepower the engine could produce over the equivalent Ferrari engine). Lamborghini did not fully compensate the designer until ordered to do so by the courts. The first Lamborghini chassis design was created by Italian chassis engineer Gian Paolo Dallara of Ferrari and Maserati fame, together with a team that included Paolo Stanzani, then a recent college graduate and Bob Wallace, a New Zealander who was known at Maserati for his keen sense of chassis handling and excellent feedback and developmental skills. The body was styled by the then-relatively unknown designer Franco Scaglione, who was selected by Ferruccio Lamborghini after passing over highly regarded names including Vignale, Ghia, Bertone, and Pininfarina. Lamborghini designed and built the Lamborghini 350GTV in only four months, in time for an October unveiling at the 1963 Turin Motor Show. Due to the ongoing disagreement with engine designer Giotto Bizzarrini, a working powerplant was not available for the prototype car in time for the show. The car went on display in Turin without an engine under its hood; according to lore, Ferruccio Lamborghini had the engine bay filled with bricks so that the car would sit at an appropriate height above the ground, and made sure that the bonnet stayed closed to hide the missing engine. The motoring press gave the 350GTV a warm response. Automobili Ferruccio Lamborghini S.p.A. was officially incorporated on 30 October 1963. Ferruccio Lamborghini purchased a 46,000 square metres (500,000 sq ft) property at Via Modena, 12, in the township of Sant'Agata Bolognese, less than 30 kilometres (19 mi) from Cento. This location was close to the centre of Italy's automobile industry and provided easy access to skilled labour and facilities. The township was chosen as the location for the factory due to a favorable financial agreement with the city's communist leadership, who promised Lamborghini a 19% interest rate on the company's profits when deposited in the bank, in addition to charging zero tax on the profits. As part of the agreement, the factory would be required to unionize its workers. Despite the favorable press reviews of the 350GTV, Ferruccio Lamborghini decided to rework the car for production. The production model, which would be called the 350GT, was restyled by Carrozzeria Touring of Milan, and a new chassis was constructed in-house. Bizzarrini's V12 engine would be detuned for mass production, developing only 280 hp (210 kW) rather than the designer's intended 360 hp (270 kW). The completed design debuted at the 1964 Geneva Motor Show, once again garnering positive reviews from the press. Production began shortly afterwards, and by the end of the year, cars had been built for 13 customers; Lamborghini sold each car at a loss in order to keep prices competitive with Ferrari's. The 350GT remained in production for a further two years, with a total of 120 cars sold. In 1965, Gian Paolo Dallara made improvements to the Bizzarrini V12, increasing its displacement to 3.9 litres, and its power output to 320 hp (240 kW) at 6,500 rpm. The engine was first installed in the 400GT, essentially a 350GT with the larger engine. At the 1966 Geneva Auto Show, Lamborghini debuted the 400GT 2+2, a stretched revision of the 350GT/400GT that featured 2+2 seating and other minor updates. The 400GT 2+2, like its predecessors, was well received by the motoring press. The revenue from sales of the 2+2 allowed Lamborghini to increase the labour force at his factory to 170 employees, and expand services offered to Lamborghini customers. During 1965, Dallara, Stanzani, and Wallace invested their personal time into the development of a prototype car that they envisioned as a road car with racing pedigree, capable of winning on the track as well as being driven on the road by enthusiasts. They hoped to sway Ferruccio Lamborghini away from the opinion that such a car would be too expensive and distract from the company's focus. When finally brought aboard, Lamborghini allowed his engineers to go ahead, deciding that the car, known as the P400, would be useful as a potential marketing tool, if nothing more. The car's rolling chassis, featuring an unusual transversely mounted mid-engine layout, was displayed at the Turin Salon in 1965, impressing showgoers. A version with bodywork styled by Bertone was finished only days before its debut at the 1966 Geneva motor show. As had happened three years earlier at the debut of the 350GTV, an ill-fitting engine meant the prototype's engine bay was filled with ballast, and the hood kept locked. 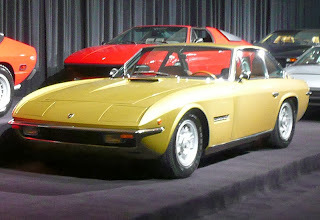 The favorable reaction to the P400 at Geneva led Lamborghini to slate the car for production by 1967, under the name Miura. The Miura's layout and styling would become the standard for mid-engine two-seat high-performance sports cars, a trend that continues today. Lamborghini now had an offering that positioned the fledgling automaker as a leader in the world of supercars, while the 400GT was the sophisticated road car that Ferruccio Lamborghini had long desired to build. By end of 1966, the workforce at the Sant'Agata factory had expanded to 300, and enough deposits were made by prospective buyers to begin final development on the Miura in 1967. The first four cars produced were kept at the factory, where Bob Wallace continued to improve and refine the car. By December, 108 cars had been delivered. Production of the 400GT continued, with Ferruccio Lamborghini seeking to replace the four-year-old design. 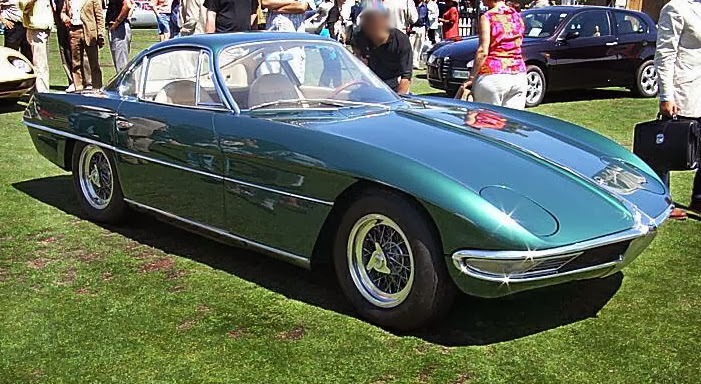 Lamborghini commissioned Touring, which had styled the 350GT and original 400GT, to design a possible replacement based on the same chassis. Touring's 400 GT Flying Star II did not win Lamborghini's approval. Giorgio Neri and Luciano Bonacini, of Neri and Bonacini coachbuilders in Modena produced their own design, the 400GT Monza, which was rejected as well. Facing mounting financial difficulties, Touring would close its doors later that year. Ferruccio Lamborghini turned to Bertone designer Mario Marazzi, who had formerly worked at Touring. Together with Lamborghini's engineers, he created a four-seater named the Marzal. The car rode on a stretched Miura chassis, and it was powered by an in-line six-cylinder that was made from one-half of Lamborghini's V12 design. Despite an innovative design that featured gullwing doors and enormous glass windows, Lamborghini rejected the design. Eventually, a toned-down version became the Islero 400GT. While the car was not the full four-seater that he desired, Ferruccio Lamborghini thought the car represented a well-developed gran turismo product. It failed to attract buyers, with only 125 cars produced between 1968 and 1969. New versions of the Miura arrived in 1968; the Miura P400 S (more commonly known as the Miura S) featured a stiffened chassis and more power, with the V12 developing 370 bhp at 7000 rpm. At the 1968 Brussels auto show, the automaker unveiled the Miura P400 Roadster (more commonly the Miura Spider), an open-top version of the coupé. Gandini, by now effectively the head of design at Bertone, had paid great attention to the details, particularly the problems of wind buffeting and noise insulation inherent to a roadster. For all of Gandini's hard work, sales manager Ubaldo Sgarzi was forced to turn potential buyers away, as Lamborghini and Bertone were unable to reach a consensus on the size of a theoretical roadster production run. The Miura Spider was sold off to an American metal alloy supplier, who wanted to use it as a marketing device. 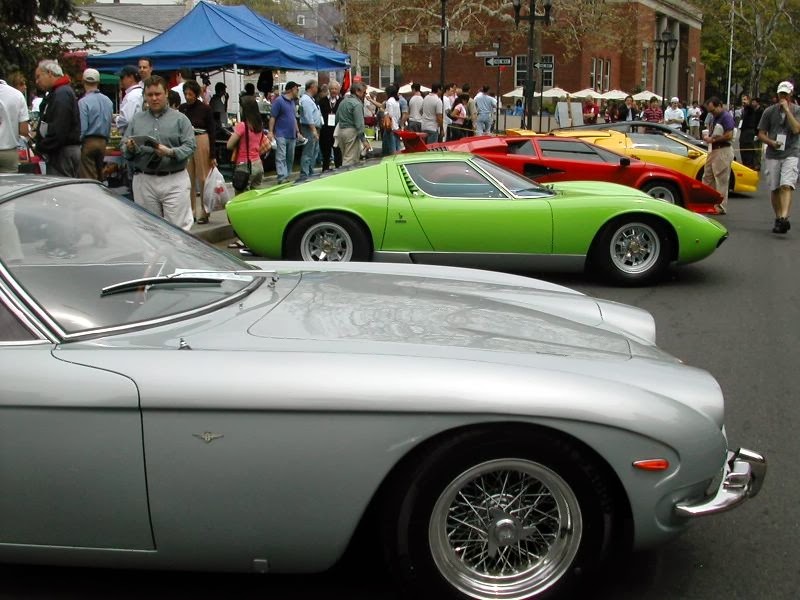 1968 was a positive time for all of Ferruccio's businesses, and Automobili delivered 353 cars over the course of the year. In August 1968, Gian Paolo Dallara, frustrated with Ferruccio Lamborghini's refusal to participate in motorsport, was recruited away from Sant'Agata to head the Formula One programme at rival automaker De Tomaso in Modena. With profits on the rise, a racing programme would have been a possibility, but Lamborghini remained against even the construction of prototypes, stating his mission as: "I wish to build GT cars without defects – quite normal, conventional but perfect – not a technical bomb. With cars like the 400GT and the Islero, his aim to establish himself and his cars as equal or superior to the works of Enzo Ferrari had been satisfied. Dallara's assistant, Paulo Stanzani, replaced him as technical director. 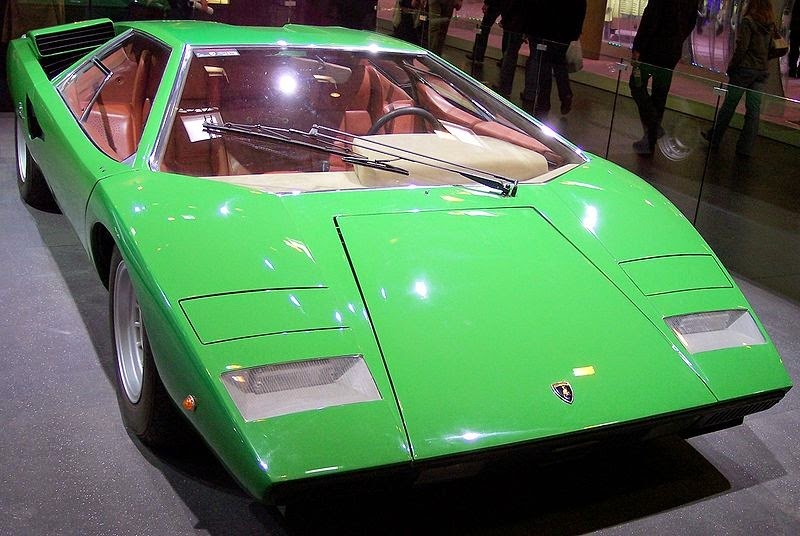 Bertone was able to persuade Lamborghini to allow them to design a brand-new four-seater. The shape was penned by Marcello Gandini, and a bodyshell delivered to Ferruccio for inspection. 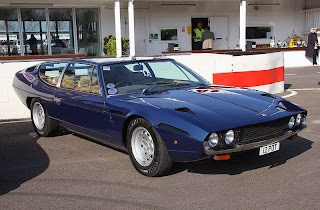 The businessman was less than pleased with the enormous gullwing doors that Gandini had included, and insisted that the car would have to feature conventional doors.The car that resulted from the collaboration was debuted at the 1969 Geneva show with the name Espada, powered by a 3.9-litre, front-mounted evolution of the factory's V12, producing 325 bhp (242 kW). The Espada was a success, with a total production run of 1,217 cars over ten years of production. In 1969, Automobili Lamborghini encountered problems with its fully unionized work force, among which the machinists and fabricators had begun to take one-hour token stoppages as part of a national campaign due to strained relations between the metal workers' union and Italian industry. Ferruccio Lamborghini, who often rolled up his sleeves and joined in the work on the factory floor, was able to motivate his staff to continue working towards their common goal despite the disruptions. Throughout that year, Lamborghini's product range, then consisting of the Islero, the Espada, and the Miura S, received upgrades across the board, with the Miura receiving a power boost, the Islero being upgraded to "S" trim, and the Espada gaining comfort and performance upgrades, which allowed it to reach speeds of up to 160 mph (260 km/h). The Islero was slated to be replaced by a shortened yet higher-performing version of the Espada, the Jarama 400GT. The 3.9-litre V12 was retained, its compression ratio increasing to 10.5:1. By the time the Jarama was unveiled at the 1970 Geneva show, Paulo Stanzani was at work on a new clean-sheet design, which would use no parts from previous Lamborghini cars. Changes in tax laws and a desire to make full use of the factory's manufacturing capacity meant that the Italian automaker would follow the direction taken by Ferrari, with its Dino 246 and Porsche, with its 911, and produce a smaller, V8-powered 2+2 car, the Urraco. 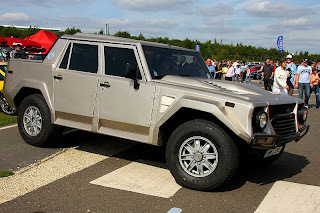 The 2+2 body style was selected as a concession to practicality, with Ferruccio acknowledging that Urraco owners might have children. The single overhead cam V8 designed by Stanzani produced 220 bhp at 5000 rpm. Bob Wallace immediately began road testing and development; the car was to be presented at the 1970 Turin motor show. In 1970, Lamborghini began development of a replacement for the Miura, which was a pioneering model, but had interior noise levels that Ferruccio Lamborghini found unacceptable and nonconforming to his brand philosophy. Engineers designed a new, longer chassis that placed the engine longitudinally, further away from the driver's seat. Designated the LP 500 for its 4.97-litre version of the company's V12, the prototype was styled by Marcello Gandini at Bertone. The car that was presented was debuted at the 1971 Geneva Motor Show, alongside the final revision of the Miura, the P400 SuperVeloce. Completing the Lamborghini range were the Espada 2, the Urraco P250, and the Jarama GT. As a world financial crisis began to take hold, Ferruccio Lamborghini's companies began to run into financial difficulties. In 1971, Lamborghini's tractor company, which exported around half of its production, ran into difficulties. Cento, Trattori's South African importer, cancelled all its orders. After staging a successful coup d'état, the new military government of Bolivia cancelled a large order of tractors that was partially ready to ship from Genoa. Trattori's employees, like Automobili's, were unionized and could not be laid off. In 1972, Lamborghini sold his entire holding in Trattori to SAME, another tractor builder. The entire Lamborghini group was now finding itself in financial troubles. Development at the automaker slowed; the production version of the LP 500 missed the 1972 Geneva Show, and only the P400 GTS version of the Jarama was on display. Faced with a need to cut costs, Paulo Stanzani set aside the LP 500's powerplant, slating a smaller, 4-litre engine for production. Ferruccio Lamborghini began courting buyers for Automobili; he entered negotiations with Georges-Henri Rossetti, a wealthy Swiss businessman and friend of Ferruccio's, as well as being the owner of an Islero and an Espada. Ferruccio sold Rossetti 51% of the company for US$600,000, thereby relinquishing control of the automaker he had founded. He continued to work at the Sant'Agata factory; Rossetti rarely involved himself in Automobili's affairs. The 1973 oil crisis plagued the sales of high performance cars from manufacturers around the world; the rising price of oil caused governments to mandate new fuel economy laws, and consumers to seek smaller, more practical modes of transportation. 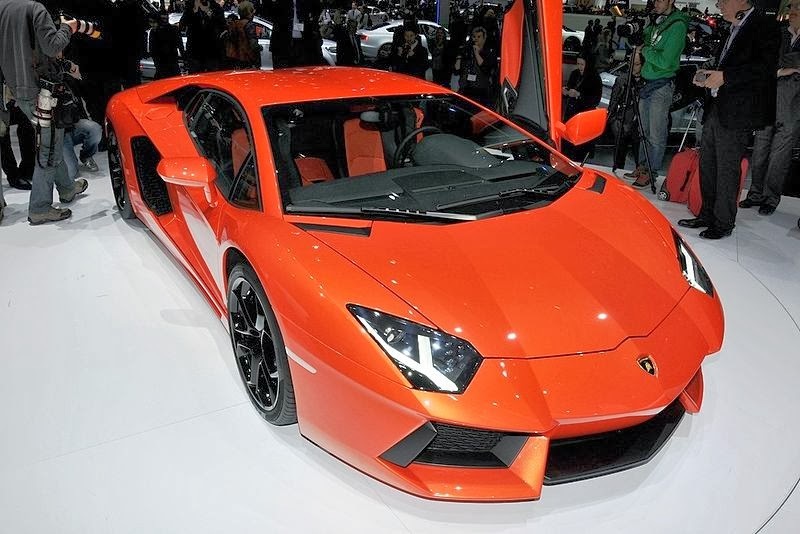 Sales of Lamborghini's exotic sports cars, propelled by high-powered engines with high fuel consumption, suffered. In 1974, Ferruccio Lamborghini sold his remaining 49% stake in Lamborghini Automobili to René Leimer, a friend of Georges-Henri Rossetti. Having severed all connections with the cars and tractors that bore his name, Lamborghini retired to an estate on the shores of Lake Trasimeno, in the province ofPerugia in central Italy, where he would remain until his death. The car shown as the LP 500 in 1971 entered production in 1974 as the Countach LP 400, powered by a smaller, 4.0-litre V12. The first production model was delivered in 1974. In 1976, the Urraco P300 was reworked into the Silhouette, featuring a Targa top and a 3-litre V8. Its poor build quality, reliability, and ergonomics all worked against it, as did the fact that it could only be imported into the U.S. via the "grey market". Only 54 were produced. The Countach was also hampered by its lack of direct participation in the American market until the LP 500S version, released in 1982. In the 1977, Geneva Motor Show, Lamborghini unveiled its first prototype military vehicle, the "Cheetah", powered by a rear-mounted Chrysler V8 engine. However, the only prototype was not destroyed during testing as rumored, but performed poorly and as such lost the contract. The resources used to develop the Cheetah were diverted from the M1 which ultimately led to the cancellation of the contract from BMW. As the years passed, Lamborghini's situation worsened; the company entered bankruptcy in 1978, and the Italian courts took control. In 1980, the Swiss brothers Jean-Claude and Patrick Mimran, famed food entrepreneurs with a passion for sports cars, were appointed to administer the company during its receivership. During administration, the automaker reworked the failed Silhouette into the Jalpa, which was powered by a 3.5-litre V8 that had been modified by former Maserati great, Giulio Alfieri. More successful than the Silhouette, the Jalpa came closer to achieving the goal of a more affordable, livable version of the Countach. 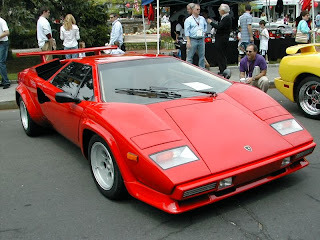 TheCountach was also updated, finally allowing it to be sold in the U.S. with the release of the LP 500S model in 1982. By 1984, the company was officially in the hands of the Mimrans. The new owners began a comprehensive restructuring programme, injecting large amounts of capital into the floundering automaker. The Sant'Agata facilities were rehabilitated, and a worldwide hiring campaign to find new engineering and design talent began in earnest. The immediate results of the investment were good. A Countach Quattrovalvole, producing 455 PS (335 kW; 449 hp), was released in 1984; further work on the failed Cheetah project resulted in the release of the Lamborghini LM002 sport utility vehicle in 1986. Lamborghini were also looking toward the future, displaying the Countach Evoluzione, a prototype supercar almost completely made of carbon fiber, to the international press in 1987. The Evoluzione was shown during its testing schedule, which ended with its destruction in a crash test. However, despite the Mimrans' efforts, the investments proved insufficient to revive the company. Seeking a large, stable financial partner, the brothers met with representatives of one of America's "Big Three" automakers, the Chrysler Corporation. On 24 April 1987, in an acquisition spearheaded by Chrysler chairman Lee Iacocca, Chrysler Corporation took control of Nuova Automobili Ferruccio Lamborghini S.p.A., paying US$25.2 million to the Mimrans. The Mimran brothers were the only owners of Lamborghini to ever make money owning the company, having sold it for many times the dollar amount they paid for it six years earlier. Iacocca, who had previously orchestrated a near-miraculous turnaround of Chrysler after the company nearly fell into bankruptcy, carried out his decision to purchase Lamborghini with no challenges from the board of directors. Chrysler executives were appointed to Lamborghini's board, but many of Lamborghini's key members remained in managing positions, including Alfieri, Marmiroli, Venturelli, Ceccarani and Ubaldo Sgarzi, who continued in his role as head of the sales department. To begin its revival, Lamborghini received a cash injection of $50 million from its new owner. Chrysler was interested in entering the "extra premium" sports car market, which Chrysler estimated at about 5,000 cars per year, worldwide. Chrysler aimed to produce a car to compete with the Ferrari 328 by 1991, and also wanted the Italians to produce an engine that could be used in a Chrysler car for the American market. Chrylser made the decision to take the company into motorsport for the first time; the effort to develop engines for Grand Prix teams would be known as Lamborghini Engineering S.p.A. The new division was based in Modena, and was given an initial budget of $5 million. Danielle Audetto was chosen to be the manager and Emile Novaro the president; their first recruit was Mauro Forghieri, a man with a stellar reputation in the world of motorsport, who had formerly managed Ferrari's Formula 1 team. Forghieri set about designing a 3.5-litre V12 engine, independent of road-car engine design undertaken at Sant'Agata. 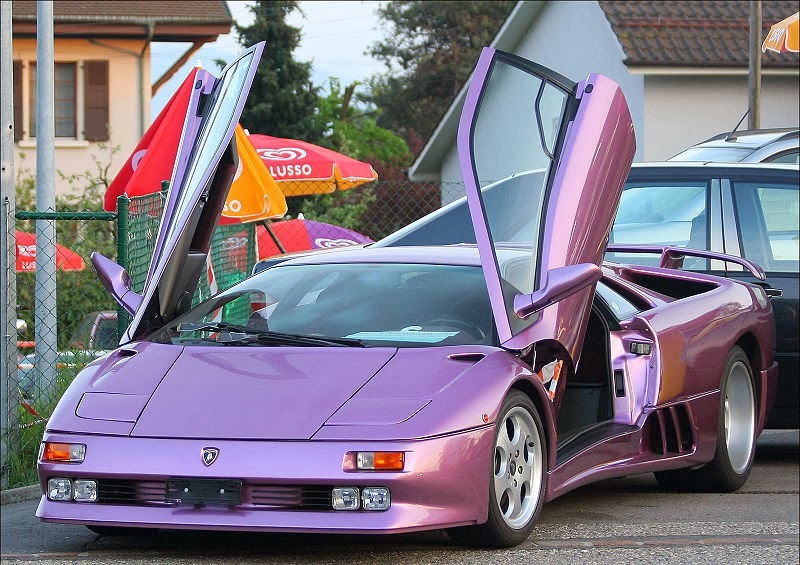 At the time, Lamborghini was working on a successor to the Countach, the Diablo. The Diablo's original design had been penned by Marcello Gandini, the veteran who had penned the exterior appearances of the Miura and the Countach while working for coachbuilder Bertone. However, Chrysler executives, unimpressed with Gandini's work, commissioned the American car-maker's own design team to execute a third extensive redesign of the car's body, smoothing out the trademark sharp edges and corners of Gandini's original design; Gandini was unimpressed with the finished product. The Diablo had been intended for release in time for September 1988, when Lamborghini would celebrate its 25th anniversary; once it was clear that mark would be missed, a final version of the Countach was rushed into production instead. By the end of 1987, Emile Novaro had returned from his long recovery, and used his authority to halt Chrysler's increasing interference in the development of the Diablo. Much to the chagrin of the Fighting Bull, Chrysler exhibited a four-door concept car at the Frankfurt Auto Show, badged as a 'Chrysler powered by Lamborghini'. The Portofino was poorly received by the motoring press and Lamborghini's employees alike, but it went on to become the inspiration for the Dodge Intrepid sedan. In April 1988, the Bertone Genesis, a Quattrovalvole V12-powered, Lamborghini-branded vehicle resembling a minivan was debuted at the Turin motor show. The unusual car, intended to gauge public reactions, was abandoned, a misfit in both Lamborghini's and Chrysler's product ranges. The Genesis had been commissioned alongside the new "baby Lambo" that would replace the Jalpa, occupying the then-empty space below the Diablo in Lamborghini's lineup. The project had been allocated a $25 million budget, with the prospect of selling more than 2,000 cars per year. The Diablo was released to the public on 21 January 1990, at an event at the Hotel de Paris in Monte Carlo. The Diablo was the fastest car in production in the world at the time, and sales were so brisk that Lamborghini began to turn a profit. The company's U.S. presence had previously consisted of a loosely affiliated and disorganized private dealer network; Chrysler established an efficient franchise with full service and spare parts support. The company also began to develop its V12 engines for powerboat racing. Profits increased past the $1 million mark in 1991, and Lamborghini enjoyed a positive era. The uptick in fortunes was to be brief; in 1992, sales crashed, as the $239,000 Diablo proved ultimately to be inaccessible to American enthusiasts. With Lamborghini bleeding money, Chrysler decided that the automaker was no longer producing enough cars to justify its investment. Chrysler began looking for someone to take Lamborghini off its hands, and found it in a holding company called MegaTech. The company was registered in Bermuda and wholly owned by Indonesian conglomerate SEDTCO Pty., headed by businessmen Setiawan Djody and Tommy Suharto, the youngest son of then-Indonesian President Suharto. 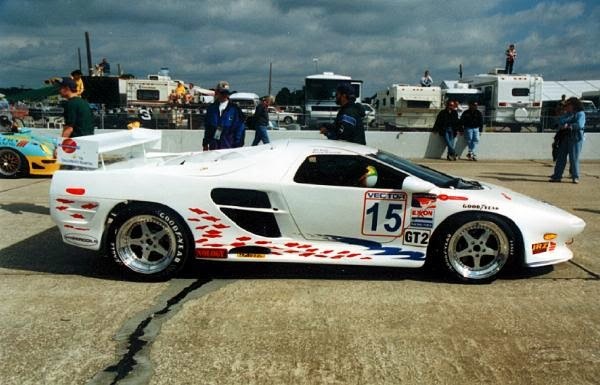 By February 1994, after $40 million had changed hands, Lamborghini had left American ownership, and MegaTech took over the automaker, its Modena racing engine factory, and the American dealer interest, Lamborghini USA. Djody, who also owned a 35% stake in troubled American supercar manufacturer Vector Motors, thought Vector and Lamborghini might be able to collaborate to improve their output. Michael J. Kimberly, formerly of Lotus, Jaguar and executive vice-president of General Motors, was appointed president and managing director. After reviewing the entire Lamborghini operation, Kimberly concluded that the company needed to expand its offerings from more than just one or two models, and provide a car accessible to American car enthusiasts. He implemented a marketing strategy to raise awareness of Lamborghini's heritage and mystique. In 1995, Lamborghini produced a hit, when the Diablo was updated to the top-end SuperVeloce model. But in 1995, even as sales were climbing, the company was restructured, with Tommy Suharto's V'Power Corporation holding a 60% interest, MyCom Bhd., a Malaysian company controlled by Jeff Yap, holding the other 40%. Never leaving the red despite its increase in sales, in November 1996 Lamborghini hired Vittorio di Capua as President and CEO, hoping that the veteran of more than 40 years at auto giant Fiat S.p.A. could finally make the sports car maker profitable again. Di Capua immediately launched cost-cutting measures, letting go of a number of company executives and consultants, and overhauling production in order to achieve a 50 percent gain in productivity. In 1997, Lamborghini finally passed its break-even point, selling 209 Diablos, thirteen more than it needed to be profitable. Di Capua also leveraged the Lamborghini name and identity, implementing aggressive merchandising and licensing deals. Development of the "baby Lambo" finally began, moving forward with a $100 million budget. The financial crisis that gripped Asia in July of that year set the stage for another ownership change. The new chairman of Volkswagen AG, Ferdinand Piëch, grandson of Volkswagen's founder, Ferdinand Porsche, went on a buying spree through 1998, purchasing Bentley, Bugatti and Lamborghini. Volkswagen subsidiary AUDI AG acquired Lamborghini in September 1998 for around US$110 million. Audi spokesman Juergen de Graeve told the Wall Street Journal that Lamborghini "could strengthen Audi's sporty profile, and on the other hand Lamborghini could benefit from [Audi's] technical expertise." Only five years after leaving American ownership, Lamborghini was now under German control. Yet again, the troubled Italian automaker was reorganized, becoming restructured into a holding company, Lamborghini Holding S.p.A., with Audi president Franz-Josef Paefgen as its chairman. Automobili Lamborghini S.p.A. became a subsidiary of the holding company, allowing it to focus specifically on designing and building cars while separate interests took care of the company's licensing deals and marine engine manufacturing. Vittorio Di Capua originally remained in charge, but eventually resigned in June 1999. He was replaced by Giuseppe Greco, another industry veteran with experience at Fiat, Alfa Romeo, and Ferrari. The Diablo's final evolution, the GT, was released, but not exported to the U.S., its low-volume production making it uneconomical to go through the process of gaining emissions and crashworthiness approval. During the Diablo's 11-year series production run, Lamborghini produced 2,900 examples. In much the same way that American ownership had influenced the design of the Diablo, Lamborghini's new German parent played a large role in the creation of the Diablo's replacement. The first new Lamborghini in more than a decade, known internally as Project L147, represented the rebirth of Lamborghini, and was named, fittingly, for the bull that originally sired the Miura line that had inspired Ferruccio Lamborghini almost 40 years before: Murciélago. The new flagship car was styled by Belgian Luc Donckerwolke, Lamborghini's new head of design. Under German ownership, Lamborghini found stability that it had not seen in many years. In 2003, Lamborghini followed up the Murciélago with the smaller, V10-equipped Gallardo, intended to be more accessible and more livable than the Murciélago. In 2007, Wolfgang Egger was appointed as the new head of design of Audi and Lamborghini, replacing Walter de'Silva, who was responsible for the design of only one car during his appointment, the Miura Concept of 2006. Towards the end of the 2000s, Lamborghini produced a number of revisions of the Murciélago and Gallardo. 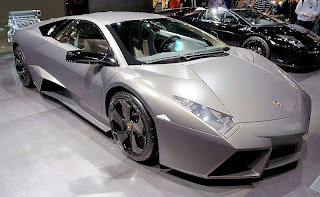 Lamborghini released the Reventón, a limited-edition derivative of the Murciélago featuring a newly designed body with more angular styling, and a roadster the following year. 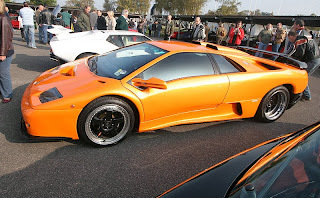 The final update to the Murciélago came in 2009 with the release of the LP 670–4 SV ("SuperVeloce"). After ten years of Murciélago series production, Lamborghini produced the 4,000th example, an LP 670–4 SV destined for China, in February 2010. Lamborghini produced the last Murciélago, number 4,099, on 11 May 2010, but did not officially mark the end of production until six months later on 5 November 2010. Lamborghini achieved its highest ever yearly sales figure in 2008, selling 2,430 vehicles. During this decade the Asia-Pacific market became more important to the company's sales performance, growing to represent 25 percent of Lamborghini's overall worldwide sales. Despite the strength of the Asia-Pacific market, the effects of the world financial crisis that began in 2007 caused Lamborghini's sales to drop almost 50% below their 2008 peak, selling 1,515 vehicles in 2009 and 1,302 vehicles in 2010. CEO Stephan Winkelmann predicted in 2009 that poor sales figures for supercars would continue through 2011; history would prove him right. The Aventador, the 349 km/h (217 mph) replacement for the Murciélago, debuted on 1 March 2011 at the 2011 Geneva Motor Show. Lamborghini revealed the Lamborghini Gallardo LP 570–4 Super Trofeo Stradale at the 2011 Frankfurt Motor Show. In 2012, Lamborghini released the Sesto Elemento (Sixth Element) for track use only. In March 2013, Lamborghini released the Veneno. Lamborghini made four Venenos, one prototype and three customer cars. Lamborghini is currently working on some final matters with the Urus that is scheduled to be released in the year 2016. Lamborghini is planning on making 3,000 each year with half of them produced being sold in the United States. In October 2013, Lamborghini released the Lamborghini Veneno Roadster based on the Veneno. Production of the Gallardo ended on 25 November 2013, after 14,022 had been produced. At the time of its discontinuation, the Gallardo was the highest selling Lamborghini model, with almost half of all Lamborghini automobiles ever produced being Gallardos. The Gallardo's replacement, the Huracán LP610-4, was announced in December 2013, and is expected to make its auto show debut at the 2014 Geneva Auto Show. The Huracan will have 602 bhp 0–100 kilometres per hour (0–62 mph) in 3.2 seconds and a top speed of over 202 miles per hour (325 km/h). This is powered by a 5.2 litre, naturally aspirated V10. The car will be all-wheel drive. The main aim of the car is to rival the Ferrari 458 and the McLaren 12C. Last updated on 29 September 2014 at 18:01.